Use the Cyber Monday to run an abandoned cart series and win back cyber sales. Based on their actions, your customers can receive well-timed retargeting emails with product links, special offers, or discount codes. Each contact who completes the purchase is tagged to help you target them with your future campaigns. for JavaScrip, click Copy code to copy the snippet to the clipboard and close the window. (At this point it’s best to save it to a temporary document in case you copy something else to the clipboard). Under Properties, enter 2 URLs: one for the cart and the other for the post-purchase thank-you page. Note: Once you’re done configuring the template, you’ll need to copy the snippet to your website’s management system or insert it directly into the HTML source code. Note: The time settings for this element are preset to the recommended value of 6 hours. 2. In the Send message element, use the drop-downs to select the message you want to send as the abandoned cart reminder. a. Double-click the element. This will open the Copy JavaScrip Code popup. 4. 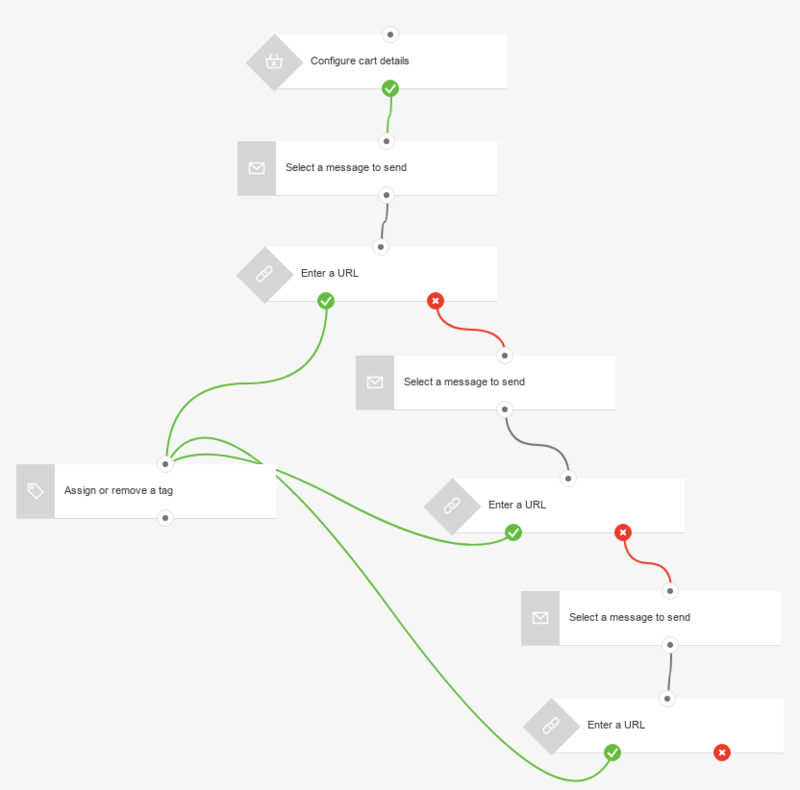 In the Send message element linked to the negative (red) connector, use the drop-downs to select the message you want to send as the reminder email. 5. In the Tag action attached to the “if yes” (green) connector of the URL visited condition, select the tag to assign to contacts who returned to your site and completed their purchase, e.g “converted”. 7. Set up the second Send message action by selecting the message to send to another reminder. 8. Follow the Step 3 instructions to configure the final URL visited element to track visits to the post-purchase thank-you page. Note: Thewait tome for the condition is preset to 1 day.